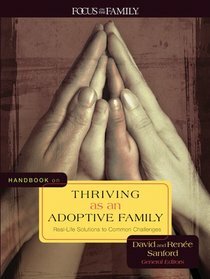 About "Handbook on Thriving as An Adoptive Family"
David Sanford has been married nearly 22 years and is the father of five children. He, along with his wife, is the director of Sanford Communications-a company that works with Christian ministry leaders and publishers to develop life-changing books. He and his wife are the conceptual creators of the Living Faith#8482; Bible from Tyndale. Reneé Sanford has been married nearly 22 years and is the mother of five children. She, along with her husband, is the director of Sanford Communications-a company that works with Christian ministry leaders and publishers to develop life-changing books. She and her husband are the conceptual creators of the Living Faith#8482; Bible from Tyndale.